A year and a half into the new era of Electronic Legal Deposit, and the introduction of Electronic Legal Deposit (eLD) is beginning to be seen on the Bodleian shelves – but only among the journals. 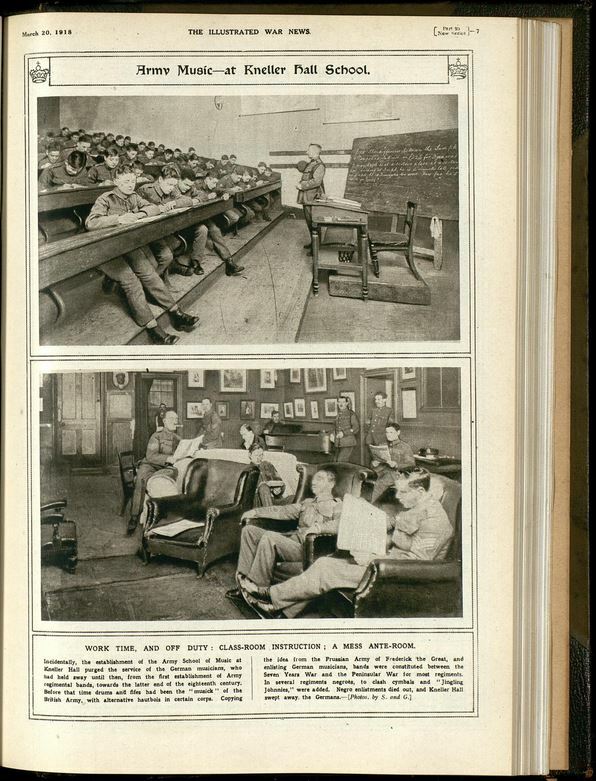 At the time of writing this post, there are no e-books accessible via eLD for history, or indeed any other subject. The impact among the history journals is the result of the publishers Cambridge University Press, Edinburgh University Press, Manchester University Press and Maney being early adopters of electronic deposit for their journal titles. The consequence is that issues of history journals are now no longer arriving as physical (ie printed) items from the Copyright Agency to sit on the Upper Reading Room current journal display and in the Humanities Journal section in the Gladstone Link. 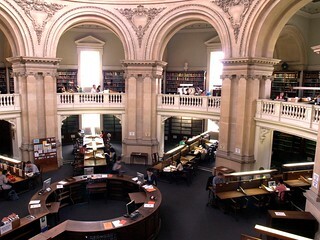 Their contents have become available to read online via Bodleian library computers. Just as readers have always had to come to the Bodleian to read issues of journals deposited in print form, so they will still need to come to a Bodleian Reading Room and be logged into a Bodleian computer to read issues deposited via eLD. In another blog post I will explain how the articles of eLD journals can be found in SOLO and accessed. For now, our readers may be somewhat reassured that we have excellent journal subscriptions which will be maintained. For instance, for the 25 key UK-published history journal titles currently coming via eLD listed below, the Bodleian also has an electronic subscription to them. Indeed, SSO holders are encouraged to access these journals via the subscription database option, as this will have much better functionality, as well as being accessible to them wherever they have access to the internet. (Not just when they are sitting at a Bodleian Library computer.). 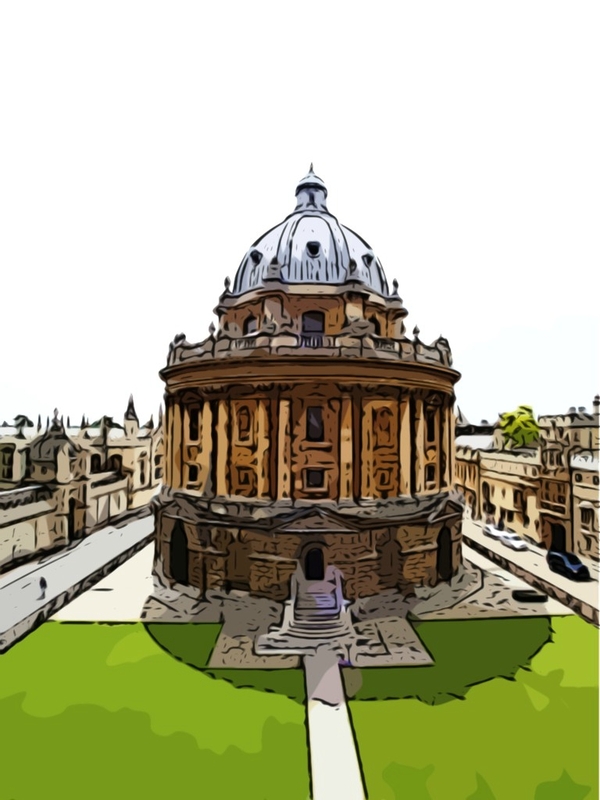 OUP is continuing to send us printed issues following a special arrangement with the Bodleian Libraries which is outside the Legal Deposit framework. Therefore issues for Past & Present, English Historical Review, etc. will continue to arrive in print. 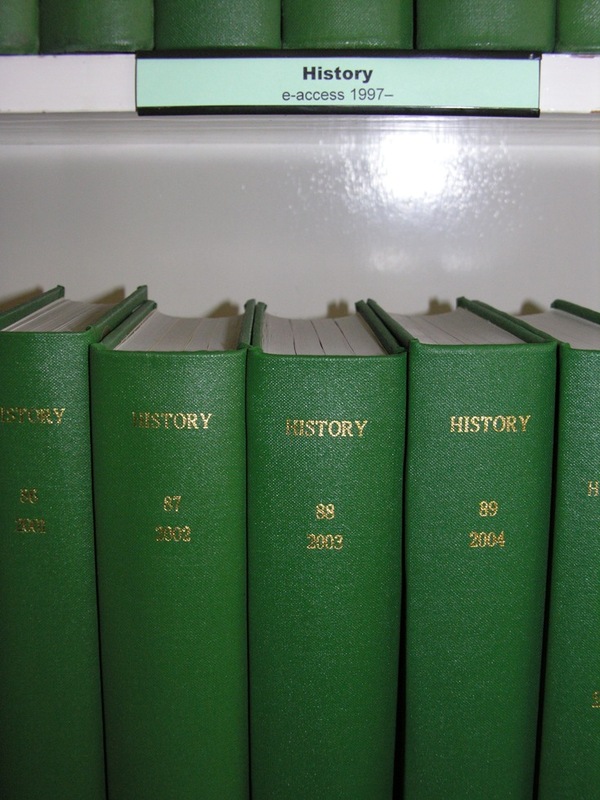 Let us suppose a reader has come into the Upper Reading Room Bod and is looking for the latest issue of the Economic History Review 67 (4) Nov 2014 on the History Current Journal display. Briefly disappointed that the latest issue is no longer being received in print and taking note of the replacement sign that this journal is coming under electronic Legal Deposit, the readers realises s/he needs now to go to a library computer in order to access the electronic copy. 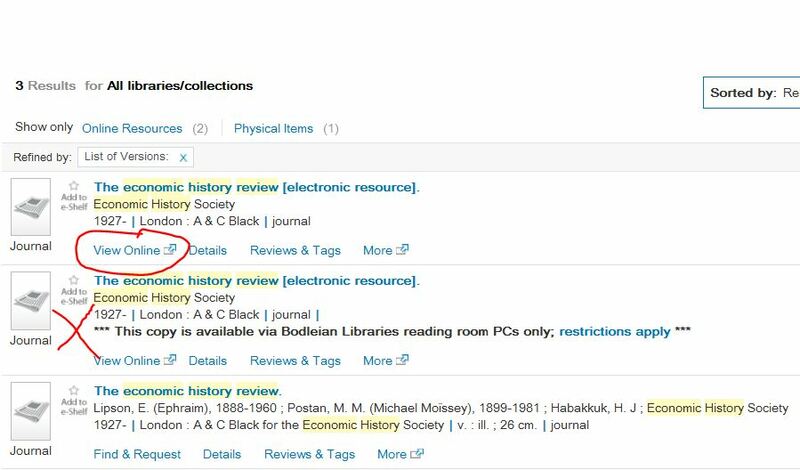 The next course of action is to either logon to a Library PC or laptop, if the reader had one, and search in SOLO for the journals title to look for the link to the electronic version. The electronic subscription should be displayed first. The electronic Legal Deposit version but can always be identified by the notice *** This copy is available via Bodleian Libraries reading room PCs only ***. In our case, our imaginary reader will use the first option, which is our electronic subscription. It is possible to print out articles from Library PCs and laptops via our PCAS service. If you wish to be alerted when a new issue is published, electronic journal subscriptions usually users to also set up content alerts, ie you will receive an email each time a new issue has been published. The Bodleian iSkills course handouts for Getting information to come to you. 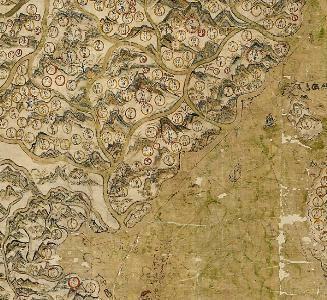 If you would like more information on how to find eLD material, the Bodleian’s SOLO Libguide includes an eLD page with audio-visual guidance.Should you encounter any problems when in a Bodleian Reading Room, you are very welcome to ask a member of staff for help – we are learning this new system too! Over the course of this week and next, the Humanities Periodicals section in the Lower Gladstone Link, covering the journals sequences for PER HIST (History), PER ENG (English) and so on, will be re-sequenced into a single interdisciplinary section. They will remain in the same area of the Lower Gladstone Link and will shelved alphabetically by title. When searching SOLO, journals shelved in the Lower Gladstone Link will have the shelfmark PER HUMS. Handlists will be available in situ to help you. Oxford has of course excellent ejournal collections so check SOLO or OU eJournals to find these online. Here is a guide to using OU eJournals. If you need help in how to browse ejournals and set up alerts, then just contact library staff. Over the course of 9th and 10th week the Humanities Periodicals section in the Lower Gladstone Link (covering History, English, Theology and Patristics, Philosophy and Classics) will be resequenced into a single interdisciplinary section. It will remain in the same section of the Lower Gladstone Link, alphabetically by title. Handlists will be available in situ to aid finding. Oxford has excellent ejournal collections so check SOLO or OU eJournals to find these online. Here is a guide to using OU eJournals. If you need help in how to browse by issue, set up alerts, then just contact library staff. There are lots of courses coming up this term to help historians get the best out of the resources available at Oxford. The following Wiser workshops are running in week 2 of Michaelmas Term. Not a member of Oxford University? If you are not a current member of Oxford University but would like to attend a workshop please contact usered@bodleian.ox.ac.uk . Please quote your Bodleian readers card barcode number. The Bodleian Libraries have subscribed to a new French History of Medicine journal entitled: Histoire, Medecine et Sante. The peer-reviewed journal, which is from the University of Toulouse II, will be published twice a year and include research articles, discussion of sources and historiography and reviews in English and French. Article summaries are provided in French and English at the end of the issue. The topic of the first issue is “pudeurs” which translates as modesty in English. Articles include Anne Carol on medical cadavers and Elsa Nicol on women with cancer in the 19th century. There is also a book review of Morbid Curiosities : Medical Museums in Nineteenth-Century Britain (OUP, 2011), which is available to consult in the Wellcome Unit Library and the Bodleian Library’s Gladstone Link, as well as electronically as an ebook. The first issue is now available to request from the Bodleian Stacks via SOLO for members of the Bodleian Libraries. The requested volume can be consulted in the Bodleian Libraries Reading Room of your choice. A full list of contents is available on the Historiens de la sante blog.